The Inspctr app provides a simple, user-friendly way of consistently maintaining high standards throughout your business, no matter what industry you are in. 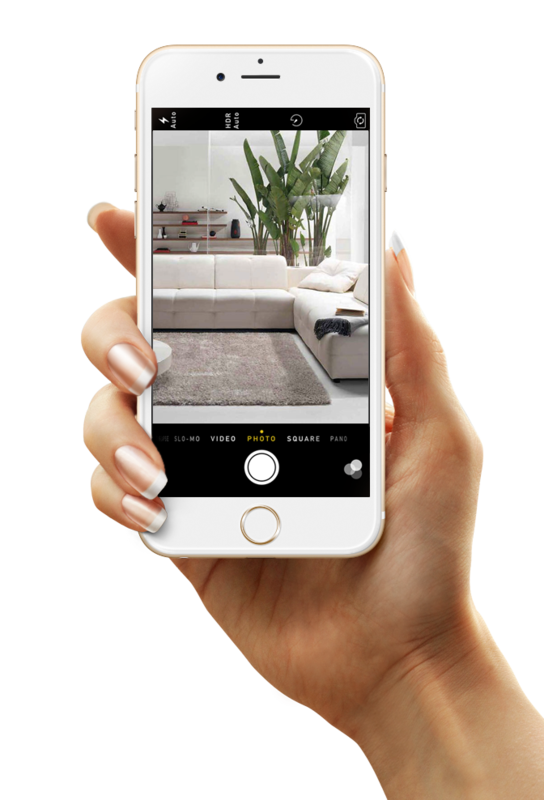 Effortlessly rate and record specific areas and items with a series of photographs to ensure your findings are fully documented for future reference. 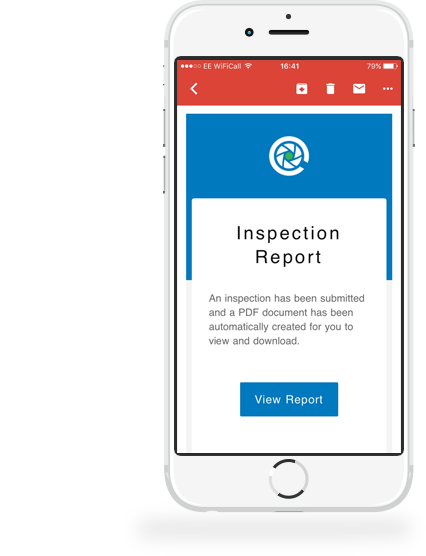 Reports are automatically created, collating all inspection findings and photographs into a professional PDF document stored safely in the cloud. Who can benefit from using Inspctr? Simply install the Inspctr app on your smart phone or tablet then you're ready to go! 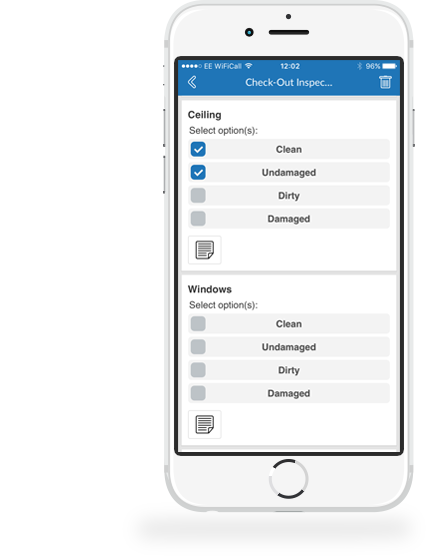 The Inspctr app provides a simple, user-friendly way of rating and recording the condition of specific items during a walk-around inspection. All photographs taken during an inspection are automatically attached to the inspection report making documenting your asset's condition quicker, easier and more professional than ever. Found a damaged item or a potential hazard? 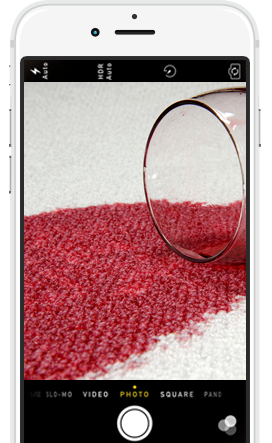 Each and every inspection with our mobile app allows you to quickly take a series of photographs to properly document the condition of your asset. This acts as irrefutable evidence if defects are found and disputes arise. By using Inspctr you stay on top of maintenance as you can quickly highlight a new defect and know the approximate date and time it occurred. Taking regular inspections enables you to compare inspection reports before and after a specific date with photographs giving you additional insights into the condition on a particular date. Inspecting regularly using your own standardised inspection process quickly alerts you to any issues which need addressing before they become potential hazards in the future. You can add notes to any issues you come across, all within the app. This helps to document the defect in detail as well as comment on the recommended course of action to fix it. Shortly after submitting your inspection you will receive an email with a link to view the PDF report. These reports are also available from within our online control panel. The Inspctr app magically collates all inspection data and photos for you, into one professional document which is archived securely in the cloud for future reference. 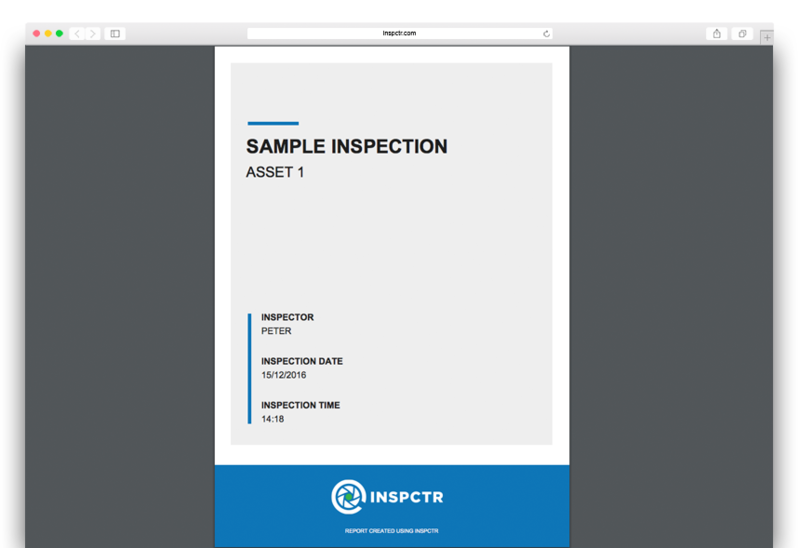 The inspection report is automatically generated collating all inspection data and photos for you, into one professional document which is archived securely in the cloud for future reference. 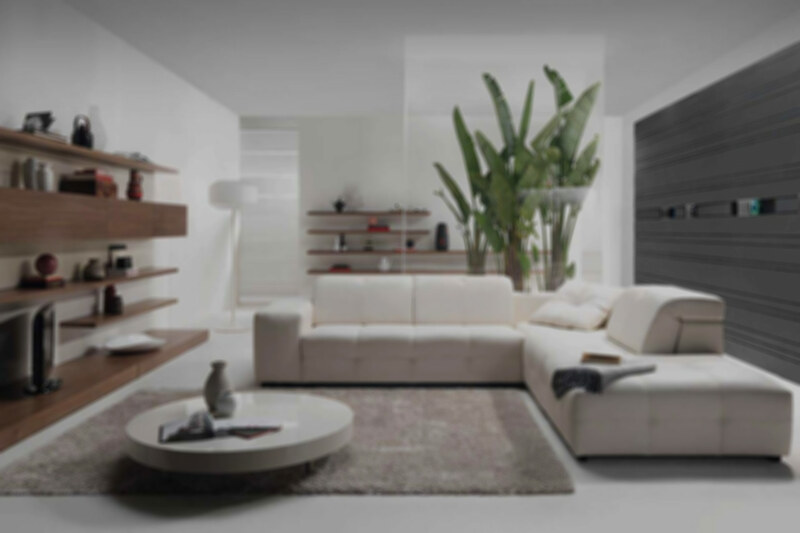 "Before and after inspections have given us peace of mind that our property is in tip-top condition for our next guests and we now have digital reports to prove it if there are any disputes on check-out." What are the benefits of digital inspections? Inspecting regularly using your own standardised inspection process quickly alerts you to any issues which need addressing. Walk-around inspections allow defects to be added quickly and easily with time-stamped photographs to document the damage. Regular inspections help to identify any maintenance and safety issues on a particular item before they become a hazard. All inspections are automatically synced via our app into your own secure online control panel where you can analyse inspection data in real-time. All inspections are carried out using our simple mobile app with all data being stored and backed up in the cloud and digital reports accessible online. Our platform empowers you to maintain high quality standards throughout your organisation without letting standards slip. An archive of your inspection history lets you go back and view reports from a specific date in case of a dispute. Meter readings and other vital information can be captured on each walk-around inspection allowing you to monitor the data in the control panel. Our inspection app and platform provides a framework for you to use the same inspection process each and every time. 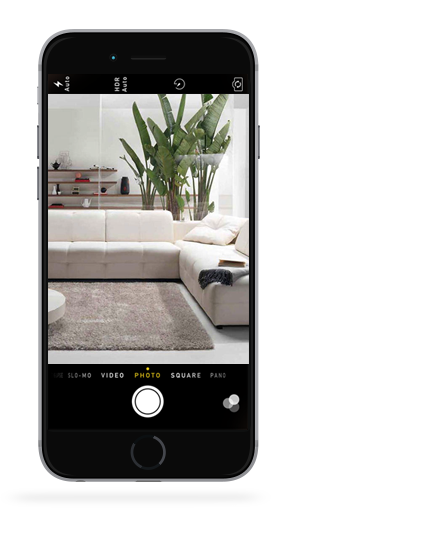 "The Inspctr app and control panel is an excellent tool to help maintain our rental property and keep it to a consistent high standard for each and every guest." Simply enter your email address below to create a free account. No credit card required and includes full customer support. For more information call us on 0113 8800 946 or email us. Inspctr Ltd. All Rights Reserved. Company No: 10004378.